As anyone who ever played with Lego can attest, there are few bigger joys in life than building something insanely ambitious only to find that it works. The only thing that tops it is smashing apart something equally elaborate and watching it collapse into hundreds of tiny pieces. Besiege takes those feelings and amplifies them, mainly through the addition of booming fireballs, crumbling castles, and splattering sheep. It’s a game where you build the most insane weapon you possibly can with the goal of obliterating everything. Well, mostly. For an Early Access game so slim in price, Besiege feels nicely heavy. From its little spinning globe of a map you can only play one of the five kingdoms right now, but the land of Ipsilon has fifteen areas to play, each one offering a different objective. Completing Besiege’s objectives requires you to build a machine to overcome a specific goal. The earliest areas quickly introduce you to the core ideas; you’ll have to figure out how to make a contraption that can steer around a minefield, one that can pick up and steal items, and something that can effectively deal as much death as possible. 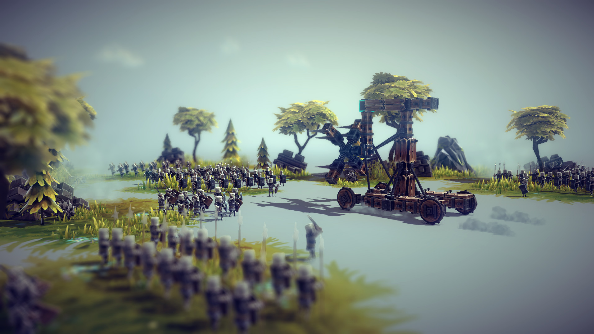 As the missions go on, Besiege asks gradually escalating feats, with larger forts and armies to overcome requiring more and more ingenuity when it comes to constructing your machine. Engineering in Besiege is beautifully simple. Like Lego it’s simply snapping together blocks. There’s only two sizes of wooden beam, and using these you’ll create a chassis. Mount this on wheels and attach a bunch of cannons and spikes to the front and you’ve got a tank ready to go. But whilst that works, that’s not where the fun lies. You can build something functional and plough through the missions in an afternoon, but Besiege’s staying power is in the small pool of mechanical items that offer up an infinite world of possibilities. At your disposal are pistons, springs, spinning plates, and gears, which can be used to create something truly incredible. 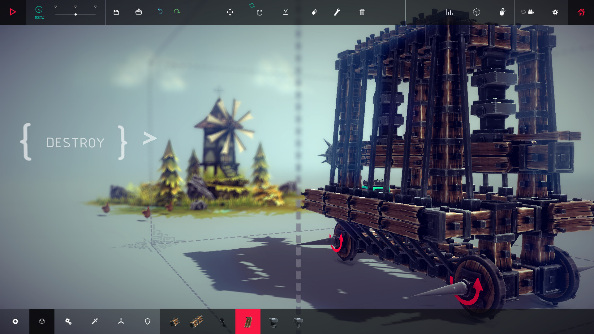 The best thing you can do on the internet right now is search for Besiege creations. There’s flying machines capable of carpet bombing an entire map, catapults that can self-reload, and even transforming robots. Sitting down and working out how to operate all the individual components to make them sing together in harmony is a challenge but absolutely Besiege’s finest feature. There’s a limit in size to what you can build when trying to complete objectives, but the Free Build mode allows you to replace the game’s goals with your own, letting you to go wild and build as big as you want. 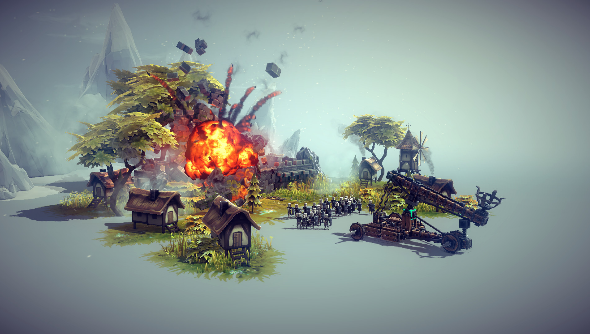 A mission of Besiege is split into two sections; a time-frozen build phase, and an action phase. During build you can spend as long as you want snapping your creation together, without niggles like gravity and momentum affecting it. The moment you go into action though, forces will act and enemy soldiers will start firing upon you. You can swap between the phases as often as you like, which nicely emphasises Besiege’s love of experimentation. It’s also vital, as much of creating the perfect machine is a puzzle, and you’ll need to continually switch between adding new pieces and trying them out. Weapons add a complication to your design. They can only be fired once, and when they’re fired they fire everything. If you put a battery of ten cannons on your machine, pressing C to fire will shoot all of them simultaneously, and there’s no way to reload. When having to fire on multiple targets that you need to move between, this makes deciding what to equip your machine with, and whereabouts on the chassis to put them, a real ponder point. Sometimes the best option is to build your own weapon, rather than install pre-made ones. Also, talking of cannons, the first time you build a machine with a hundred cannons on and pull the trigger, the recoil will cause the entire thing to shatter. It’s a hilarious lesson in the importance of bracing your structure together. Besiege is one of a set of Early Access games I can count on my finger and thumb that I feel I can absolutely recommend you buy. As a toy box it’s practically unrivalled; with just a small selection of gizmos you can build the most ingenious, bizarre, joyful, and imaginative creations, and then use them to utterly destroy a village filled with tiny men and sheep. The actual campaign content may just be a few hours, but this is a game that will feed on your imagination for weeks. It already feels closer to completion than some AAA games, despite only being in alpha, thanks to what appears to be a focus on getting the mechanics nailed down before moving onto broader content. That’s exactly the philosophy that Early Access should be about, and it feels great that someone’s finally figured it out. 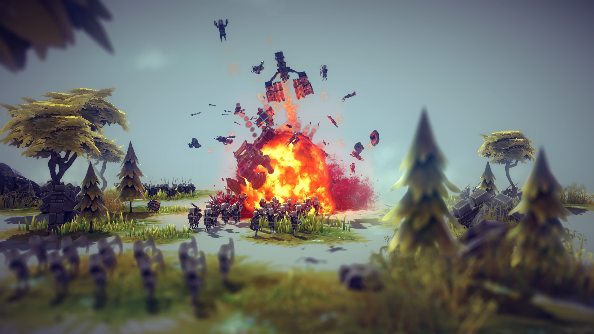 Basically, there’s nothing not to like about Besiege.